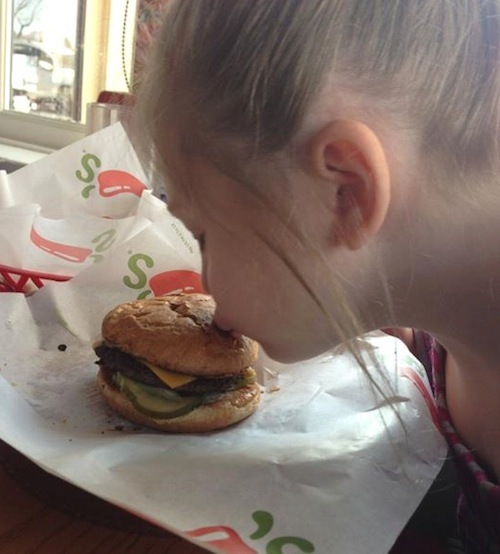 A year after a young girl with autism was served a “broken cheeseburger” at Chili’s, the restaurant chain is launching a national Give Back Event on April 7th, donating 10 percent of qualifying guest checks to the National Autism Association. Here’s what happened: a Chili’s server in Midvale, Utah brought a little girl her kid’s cheeseburger, cut in half. Unbeknownst to the server, however, Chili’s standard presentation of a sliced cheeseburger signified the burger was “broken” to the little girl. The server quickly had a new burger made to the delight of the little girl, who kissed the “fixed” cheeseburger, captured in a photo by the little girl’s sister. This photo and the story was shared on Chili’s Facebook page with a sincere ‘thank you” by the little girl’s sister. The post spread like wildfire with 876,496 “likes” and 207,220 “shares”. Since then, the server and young girl’s friendship has continued and inspired the brand’s recent efforts to support the autism community. This simple story demonstrates a powerful humanizing of a large corporate brand. The story itself might have gone unnoticed to anyone except the server, the little girl and her family but for the authentic sharing via social media which struck a nerve of those who read it. Here’s the powerful piece: Chili’s was smart enough to pick up on this story and create an easy way for others to take a simple action via their Give Back Event for the autism cause. What other ways have you seen corporate or charity brands humanized effectively? Share in the comments below. Lesson? Weigh in below w/ your thoughts!